The first archeological evidence of Jewish presence in Greece is a 300-250 B.C.E. inscription from Attica. The oldest synagogue of the Diaspora was found on the island of Delos, and dates from the early 1st century B.C.E. When in Thessalonica, Apostle Paul found a well-organized Jewish Community, as in many other Greek cities, including Philippi, Verroia, Corinth and probably Athens. In Roman times, the number of Jews rose due to immigration, and constituted the core of the Byzantine Jewish Communities. 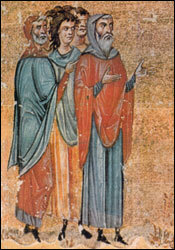 In the 12th century C.E., the Spanish Jewish traveller, Benjamin of Tudela, mentions Jewish Communities in many cities on the mainland and on the largest Greek islands. Their main occupations were weaving, dying of textiles and the silk industry. These Jews, who were later called “Romaniotes”, spoke Greek and espoused the Greek culture; they even wrote in Greek using Hebrew characters. 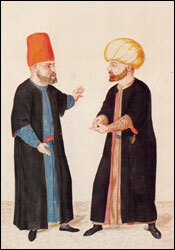 The Ottoman occupation relegated all non-Muslims to second place; they were, however, free to practice their faith and had limited autonomy on community matters. Recognising the importance of an active Jewish population, the Ottoman Empire opened its doors to the persecuted Jews of Spain and Portugal, who settled in Greece mainly in the 15th century. They were called Sephardim (Sepharad = Spain) and brought with them their language (Judeo-Espagnol), customs and traditions. Other, smaller groups arrived from Hungary and Southern Italy. Between the 16th and 18th century, the Jewish community of Thessalonica was one of the largest in the world. Other important ones were those of Rhodes and Crete; the latter was renowned for the local development of Rabbinical Philosophy. After the modern Greek State was founded in 1832, all citizens, including Jews, were granted equal civil rights from 1882 till 1920 all Jewish communities in the country were recognized as legal entities. Following the expansion of the Greek border after the Balkan Wars (1912-13), the number of Jews in Greece grew to approximately 100,000. During World War II, when Italy (1940) and Germany (1941) attacked Greece, many Jews fought in the ranks of the Greek Armed Forces. During the Occupation, most Jewish Communities were almost completely wiped out, as the majority of their members were murdered at the death camps. The losses reached a staggering 87 percent of the pre-war Jewish population, one of the highest in Europe. Those who survived the War owe their lives to the help of their Christian compatriots. Several joined the Resistance or the Greek Army in the Middle East. The Jewish population of Greece declined even further after the end of WW II, due to emigration, mainly to Israel and the U.S.A. Today only about 5,000 Jews live in Greece, organized in 9 communities.